Microsoft has long held that the Microsoft Graph — the data it collects as a byproduct of people simply using their online tools — provides a wealth of information that companies can use to understand their workers better. 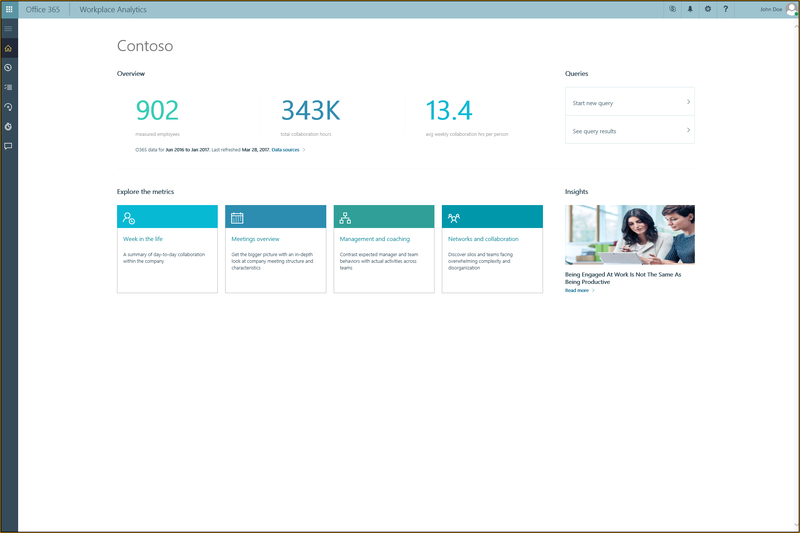 Today, the company announced general availability of Workplace Analytics, which has been designed to give managers and executives a broad understanding of employee productivity across departments based on Microsoft Graph data. Last year, Microsoft introduced MyAnalytics to give employees a view of their individual productivity based on their calendar, email, documents, Skype and other information gleaned from their Office 365 usage data. At the time, TechCrunch’s Frederic Lardinois wrote that while employees could see that data, their managers could not. Today, that changes, but Alym Rayani, director for Office 365 insists this is about using data to understand what behaviors create the most productive employees. “Even when you have quantifiable outcomes, inputs and behaviors are not always well understood. It’s important to know what “good” is. It’s even harder to [identify] the underlying behaviors that will drive that employee satisfaction,” he said. Rayani says research has shown that increasing employee productivity and engagement is going to be a big priority for organizations moving forward. That requires insight and data, precisely what he says Workplace Analytics has been designed to provide. For the initial launch, the product is looking at email and calendar data since this should provide a great deal of insight into how individual workers are spending their days, but over time they could be exploring other types of data being generated in the Microsoft Graph. Microsoft is providing an overview dashboard inside Workplace Analytics and 4 standard views of organizational productivity including Week in the life, which looks at how the entire company spends time and collaborates; Meetings, which looks at the quantity and quality of time spent in meetings; Management and coaching, which measures how much one-on-one time employees are spending with their managers and Networks and collaboration, which looks at how employees are connecting across the company. You may be thinking if it can look at positive behaviors and productive employees, it could also be used conversely to identify employees who are being less productive, but Rayani says throughout the private beta, not one company was using it to call out employees. Instead he said it was about looking at output versus behaviors and finding ways to improve the outcomes. For example, managers could look at the activities of top performers and learn how those people spent their day, then use that data to teach other employees to use those techniques to improve productivity. The product could require some consulting help from Microsoft to get going, especially if customers want to create custom dashboards beyond the ones available out-of-the-box. Customers could also potentially combine Workplace Analytics data with other data they are collecting across the organization to give management a more complete picture, even if all that data isn’t coming from Microsoft products. That kind of customization would also likely require consulting help.